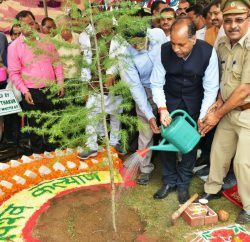 Chief Minister Prem Kumar Dhumal inaugurated the 62nd Van Mahotsav by planting a sapling of ‘Beel Patre’ at Bail Village of Una district. Addressing a public meeting at Bail Village, Prof. Dhumal said that 704 panchayats are being covered under Mid Himayalyan Watershed Project in the State and Rs. 540 crore will be spent on it. He said that Rs. 180 crore Swan river watershed project was being implemented in the District under which 96 Gram Panchayats would developed. He said that TD rights had also been restored to the people of the State and Khair and resin sale had been made control free and added that bamboo sale would also be made control free in the State. Chief Minister said the State has Forest wealth of about Rs. 1.50 lakh crore which has been protected by the people of the State so as to maintain the eco-logical system of the Himayan regions could be maintained. He said that direct and indirect benefits of about Rs. 1100 crore is being got by the people of the State from forests every year. He said that 5000 women of Scheduled Caste would be benefitted under ‘Mata Sabri Mahila Sashaktikaran Yojna’ under which they would be provided with stove and LPG connection on 50 present subsidies. He said that Rs. 137 crore was being spent under forestry activities during current financial year in the State and urged the people to help protect the forests so that entire State could be brought under green cover. Prof. Dhumal also stressed the need to make Van Mohotsav a people’s movement and added that all those involve in this campaign should also work with responsibility for its success. He said that maintenance and monitoring of planted saplings was also essential so that green cover of the State could further be enhanced. He said that Government with the direction of Supreme Court had re-started all the 283 Saw mills and restriction on failing of trees on private land had also been removed so that farmers and fruit growers could make proper use of such trees to meet out their domestic needs. He said that the world today was facing the problem like global warming and climate change which could be solved by expanding increasing green cover to a great extent. 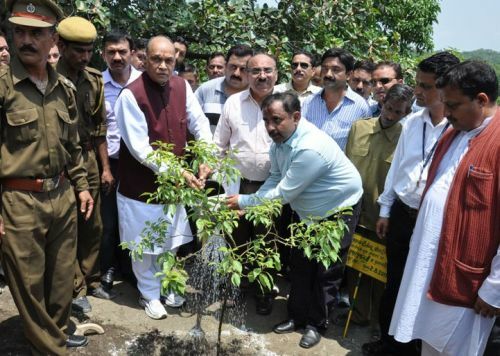 Chief Minister appealed the people of the State to extend their cooperation by planting saplings on waste land and help increase the green cover of the State for which Government would provide saplings and other necessary assistance to them. He said that 102 Van Sarovers would be constructed under ‘Van Sarovars Scheme’ during current financial year in the State so that water cold adequately be stored in rural areas also. He said that Himachal Pradesh was the 1st State in the world which has signed carbon credit agreement with the World Bank and added that 4004 hectares of land would be developed under the scheme. He said that green cover of the State had been enhanced to 26.35 percent from 21.16 percent in last two decades. He said that State Government had also formulated a scheme to check the increasing population of monkeys and added that monkeys after undergoing sterilization would be left in the same place or forest from where they had been picked up . He said that there were four monkey sterilization Centres in the State at Hamairpur, Gopalpur, Tutikandi and Kail in which sterilization works of moneys were been carried out for having check on their population. Chief Minister said that protected areas network which was 12.86 percent of total geo-graphical would further be enhanced to 15 percent. He said that Hamipur Forest Circle also earned an income of Rs. 13 lakh by selling pine leaves/needles abd similarly Una Forest Circle Division sold 7,389 quintal pine needles and earned Rs. 11 lakh. Chief Minister also sanctioned Rs, 50 lakh for Agri Centres and also made budget announcement for road construction. Earlier Chief Parliamentary Secretary Vinrender Kumar welcomed Chief Minister to the assembly segment and thanked him for dedication and laying foundation-stone of schemes worth cores of rupees in Santokhgarh Assembly Segment. He also apprised the Chief Minister of various others local demands and detailed out the activities carried out in last three and half years. He also urged to develop the area from – point of view. Dr. Vinay Tandom, Principal Chief Conservation of Forest said that 2011 is being celebrated as International Forestry year. He also detailed out the activities undertaken by the Department. Ravinder Singh Ravi, Irrigation & Public Health Minister, Sat Pal Satti, CPS, Balbir Chaudhary, Desh Raj. MLAs, Balbir Bagga, President, BJP, S.C. Morcha, Vikram Thakur, Vice Chairmen State Forest Corporation, Santosh Saini, Chairperson, HIMFED, Parveen Sharma, Vice-Chairman, State Water Management Board, Rani Ranaut, Chairperson, Zila Parishad, Kamla Kashyap, Chairperson, Nagar Parishad, S. Roy, Additional Chief Secretary, A..K. Gupta, Additional Pr. Chief Conservator of Forest, R.K. Gupta, Managing Director, State Forest Corporation, Deputy Commissioner, S.P. and other senior officers of the district were also present on the occasion.